With just a few hours left for the election in Mandya Lok Sabha segment, the distribution of money and circulation of pictures, videos and audio clippings to prove the violations, were reported on Wednesday. The voters are not only given money, but are forced to swear in the name of Lord Manjunatha, with a picture, sources said. The sugar town of the state, which was abuzz with activity with rallies and conventions on the last day of the public campaigning on Tuesday, was equally busy on Wednesday with the supporters of both JD(S) candidate K Nikhil and Independent candidate A Sumalatha respectively, luring the voters with cash. As soon as public campaigning came to an end at 6 pm on Tuesday, the candidates started door-to-door campaign, meeting people and explaining the voting process with a model electronic voting machine. The leaders, who are not voters of Mandya district, have left the constituency. Pictures of Rs 2,000 in cash along with Dharmasthala Manjunatha Swamy’s cards, are widely circulated on the social media. It is said that the voters are told to swear in the name of God that they would vote for their respective candidate. The money is being distributed in the booth-level, although poll officials are keeping a vigil. An audio clipping claiming to be between former councillor Shivaprakash Babu and one Somanna has gone viral on the social media. Somanna is heard saying that film producer Rockline Venkatesh has given ‘One’ to K R Pet taluk on behalf of the Independent candidate. However, it is not clear whether it is Rs 1 lakh or Rs 1 crore. Meanwhile, Sumalatha, on her Facebook page has posted a message thanking 4,500 people, who are coming from Mumbai to cast their votes in Mandya. While Sumalatha’s name is in the voter list of Doddarasinakere, in Maddur taluk, Nikhil’s name is in Magadi constituency, Ramanagar district. she had nothing to do with the ticket. 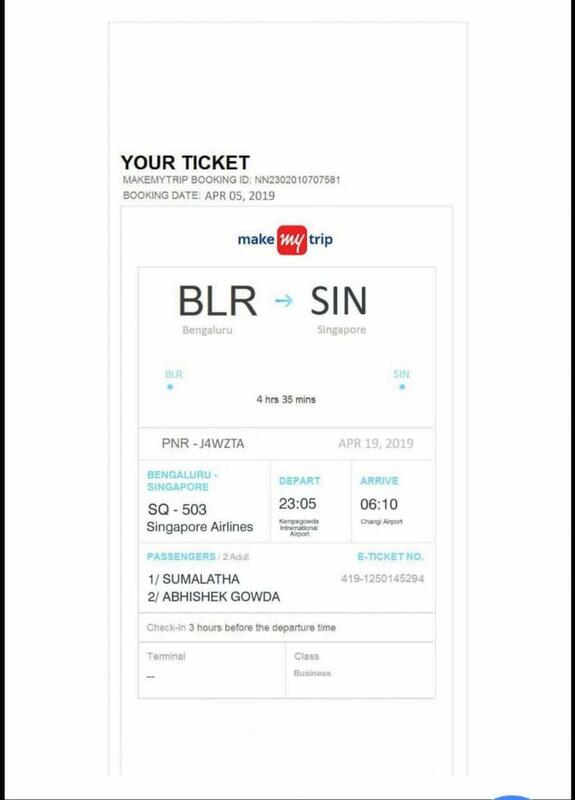 The ticket has been booked on Make My Trip App, with both their names. Sumalatha said, “The Chief Minister is trying to tarnish my image right from the beginning. Have I not seen Singapore earlier? There is no need for me to go to Singapore the very next day of the election,” she said.